This all-encompassing home is the result. 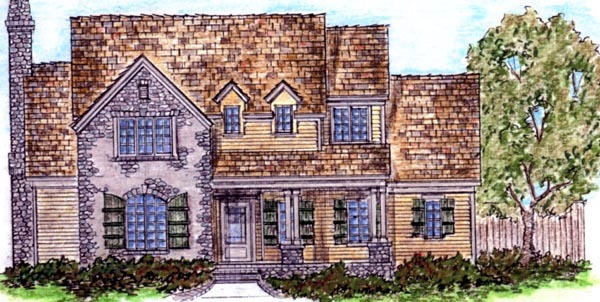 The Baby Boomers loved the concept of traditional neighborhood design (TND) and offered their opinions of what a TND home's floor plan should include--all of which are contained in this home: 1. Master bedroom down 2. A single dining area. 3. A standard tub in the master bath. 4. A larger shower in the master bath. 5. Detached quarters for home office or a private living space for an aging parent. 6. Separate spaces for computer use (accomplished by including a "Resource Center" and a study). Note also the courtyard space formed by the home's footprint and the detached, two-car garage. There's room enough here for a small pool, if desired. 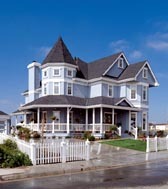 The home's exterior is an eclectic mix of American country and European flair.